CIRRICQ » Federated States in Circumpolar Affairs: A Northern Dimension to Que?bec’s International Policy? Since launching Plan Nord in 2011, Québec has become more assertive on the international stage in order to attract foreign capital for economic development projects in Northern Québec. The steps it has taken to promote Plan Nord have also allowed Québec to expand its ties with many state and non-governmental stakeholders in the circumpolar world. Since Philippe Couillard’s election as premier, Québec has, through the Department of International Relations and Plan Nord, clearly been establishing closer relations with a region of the world in which previous governments traditionally showed little interest. This report aims to put into perspective the public diplomacy process that has led Québec to forge new ties with the Republic of Iceland and the Euro-Arctic world. If Québec is now more interested in the Arctic world, when did this shift occur, and what are its implications for Québec’s new international policy, to be unveiled in 2017, whose traditional pillars are the United States and la Francophonie? 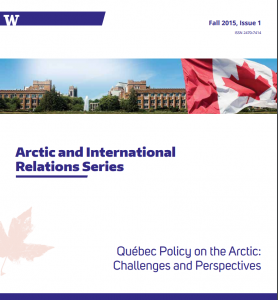 Is Québec seeking to integrate a Nordic dimension into its international policy?